I need to preface this post with a warning. A warning because most of the items shown below are going to be girly. Girlier than usual. I know, how is that possible but somehow I've managed to find some of the most feminine kitchen goods known to mankind. If you don't like what you see, leave me a comment. If you do like what you see, leave me a comment anyways. Oh, and I need to give you another warning because some of the items below will be a bit pricier than usual. But hey this is my wish list, right? La Patisserie Footed Bowls - Set of 3 from Home Decorators Collection for $139.00. Perfect for serving dessert or pastries when entertaining. Tulip Tumbler from Anthropologie for $8.00. For casual affairs, I would drink champagne out of this. Rosanna Bowls - Set of 6 from Home Decorators Collection for $39.00. Assorted Blue & White Teardrop Dishes from Pier 1 Imports for $2.00. 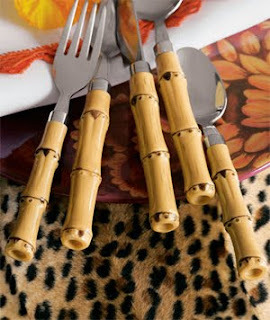 20-Piece Bamboo Flatware Service from Neiman Marcus for $24.90. I am so tempted to buy these right now. Never thought I could actually afford something from Neiman Marcus! Jars with Lids from Crate and Barrel for $9.95 - $19.95. L'Objet Antique Gold Two-Piece Serving Set from Saks Fifth Avenue for $170.00. So this is one of those items that are just a bit on the pricier side but its just so beautiful! Jessie Steele Cream & Black Damask Apron from Wrapables.com for $25.99. Diva Delights Fashionista Apron from Wrapables.com for $16.99. Gotta have something cute to wear while you're in the kitchen. L’Objet Kyoto Rectangular Platter 8" x 16" from LCR Collection for $187.00. I've been really into Asian inspired patterns lately and especially if it's in red. Plates that are colorful and bold make the table just pop and make eating a feast for the eyes as well as the stomach. 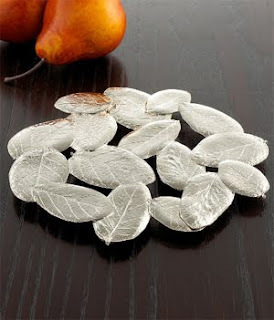 Michael Aram "Forest Leaf" Trivet from Macy's for $59.00. Have you ever seen a trivet like this before? Neither have I. It looks like a piece of art and the leaves make it perfect to use for the Fall season. Doily Coaster Set from Beehive Kitchenware Co. for $45.00. Very delicate looking but is made of enameled brass with cork backing. 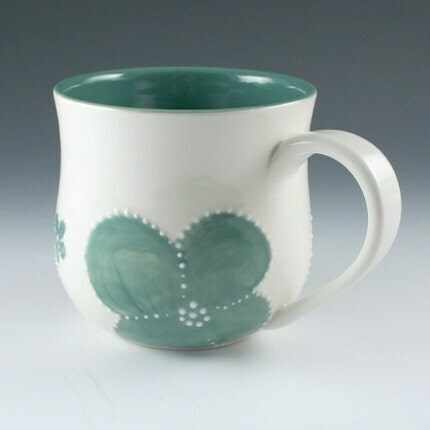 Flower Mug with Teal Accents from Kim Westad on Etsy for $20.00. I'm always on the look out for new mugs to drink my coffee out of. I might have to add this to my collection. Look out for Part II of this series! There's more!